Currency exchange is a necessity of international business, and it is important to stay in the know when you are on the go. To provide you the handy solution we are here with the perfect choice that you will really adore. 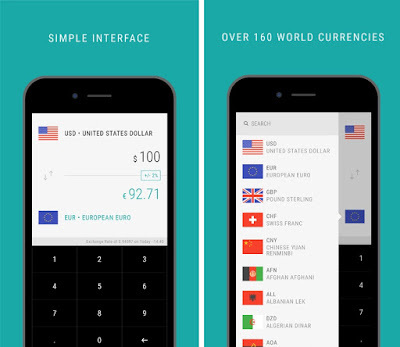 Valuta - Currency Converter will accomplish all your currency conversion need on the go! Valuta - Currency Converter is a perfect conversion app that handles over 160 of the world’s active currencies including Bitcoin. Updated automatically, the interface is simple and easy to understand. It also handles several of new virtual currencies. Automatic updates are also available to keep the user current with the world’s exchange rates. The app gives you access to the famous sources of updates and in addition, available in multiple languages. The interface simple and easy to use interface: Swipe right to clear input and ta the country flag to change the currency. It stores all the currencies in its offline database. You can also search through currencies via name, code or country. The best thing about the app is that you can choose between incorporate typical dealer margins of various retail currency exchange markets.